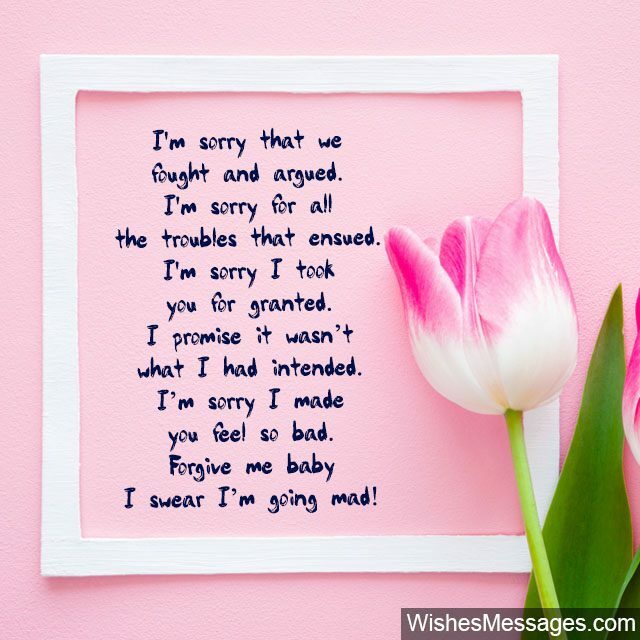 I am Sorry Messages for your Wife: From cute quotes about love to the sweetest messages that plead for forgiveness – take ideas from this post to say sorry to your wife. Husband-wife dramas are a common sight in all marriages. No relationship is exempt from fights, arguments and endless banter… but that’s the easy part. Apologizing and saying sorry is where it really gets tough. A cutesy apology on Facebook or Instagram may be enough for something small but if you think you’ve done something which has made her feel really bad, go the extra mile and write a note on a card. Don’t forget to make it up by taking her out on a romantic date. And while we make no promises to fix broken relationships, we promise this post is rife with ideas that’ll help you come up with your own original and heartfelt apology! 1) I never meant to insult you, I never meant to hurt you. 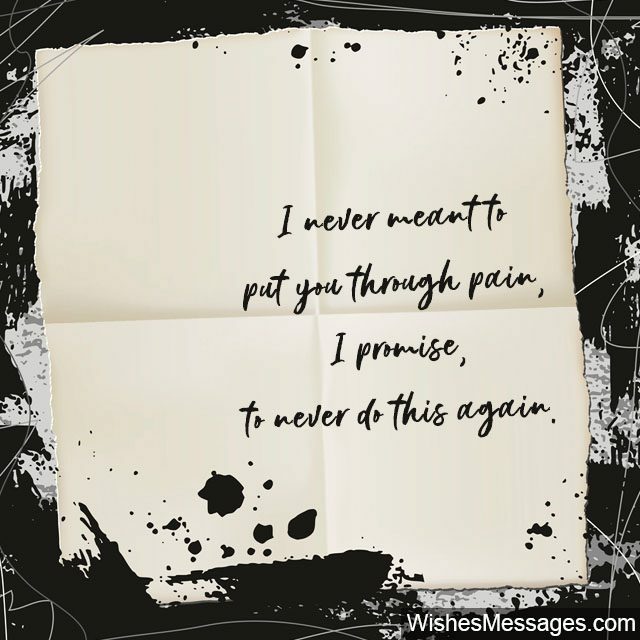 I never meant to put you through pain, and I promise, to never do this again. I am sorry, please forgive me. 2) My heart will rot in guilt because I will never forgive myself for what I did… but it will still continue beating to seek solace in your forgiveness. I’m sorry. 3) I lied to you and even tried to cover it up on the run, which made me look like a nasty villain. But I promise that the tolerance for lies in our relationship is ZERO, and I’ll prove it to you by being your HERO. 4) I’m sorry, that in your eyes, I couldn’t stand tall. You, of all the people in the world, don’t deserve this at all. Smiles on your face, I desperately want to see… the man I really am, I promise to be. 5) Sorry for hurting you baby, I never meant to be so heartless. Please forgive me… without your love, I’m truly worthless. 8) For all the memories we share, for all the smiles we’ve had… for all the that we are, it breaks my heart to see you sad. I’m so sorry baby. 9) I am not saying sorry to you because it is the most convenient thing to do. I am saying sorry because I am drowning in the regret of my actions towards you. I love you. 10) The most profound apologies are never heard by the ears, they’re felt through the heart. So put your hand on my heart and just feel it weeping out in regret – I’m sorry. 11) For all the mean things I said, I’m sorry. For all the times I’ve been rude, I’m sorry. For all the times I made you cry, I’m sorry. 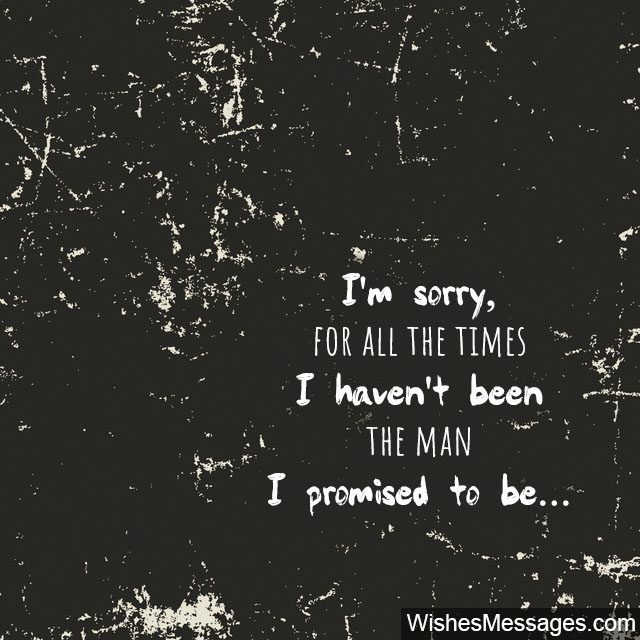 For all the times I haven’t been the man I promised you to be… I am sorry. 12) I may be sorry, but the pain of seeing the tears in your eyes is going to haunt me forever. I’m sorry, I truly am. 13) I confess that what I said what a lie, but that doesn’t make me a liar. Just because we’re going through a rough patch, doesn’t mean our love will expire. I’m going to bare open my heart to you in the coming days, so you can see how regret is breaking me from inside in every possible way. Sorry. 14) Big or small, lies are lies. 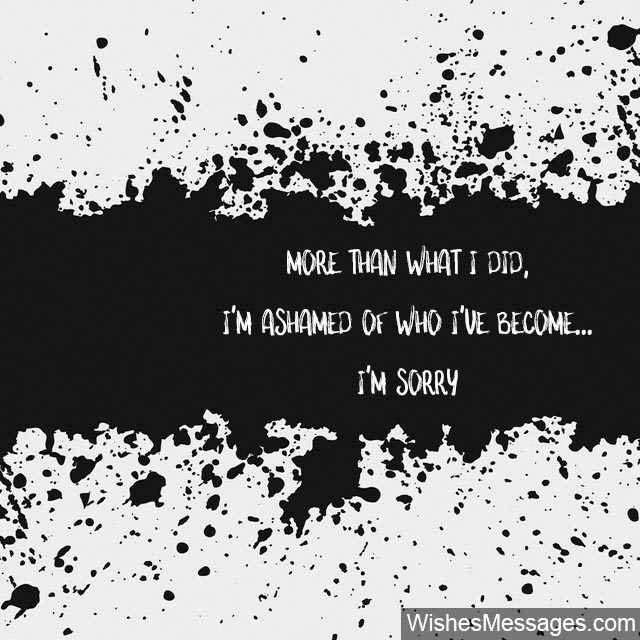 I’m ashamed, that I made you cry. In regret, I’m miserably drowning. For your forgiveness, I’m desperately waiting. 17) There are no limits to my remorse and guilt, you have no idea how badly I’ll wilt. I acted in a state of unawareness, please forgive me, my princess. 18) The word SORRY is OVERUSED by Me and UNDERUSED by You. How about we both call it even and move on? I love you. 20) Haven’t you heard that people fight only with those who they love the most? The fact that I have fought with you means only one thing – that I love you a lot. Sorry. 21) More than what I did, I’m ashamed of who I’ve become. I’m sorry. 22) My heart is trapped in the gallows of regret… only your forgiveness can set it free. I love you baby. 23) I am sorry for being a nag and continuously telling you what to do. It’s just that I’m uber protective when it comes to you. Sorry. 24) Our married life was supposed to be a Romantic Comedy, but my actions made it seem like a Horror Story. I’m sorry, I promise that I’ll be the hero that you deserve and give it the Happy Ending it deserves. 25) I have always chosen everything in my life very carefully, but I faltered when I called you names. I promise that from now on, I will choose my words carefully too. I’m sorry. 26) I am sorry that we fought and argued. I am sorry for all the troubles that ensued. I am sorry I took you for granted. I promise it wasn’t what I had intended. I’m sorry I made you feel bad. Forgive me baby… I’m going mad. 28) Do you know why your husband wants to give you a really long apologeeeeeeeeeeeeeeee? That is because he is really sorrieeeeeeeeeeeeeee. 29) I know why you’re not accepting my apology! you want me to pamper and cajole you all day. But you don’t need to put your forgiveness on hold for that, I’ll do that anyway. 30) I don’t have anything to show you how sorry I am, except the tears in my eyes. Give me a chance, to show that you, are my life’s most precious prize. I love you, I’m sorry. 31) You’ve always been the mature one between us two. I hope you’ll forgive me like you always do. Muah. 33) I am sorry that I lied. But I am not lying when I say sorry. Please forgive me sweetheart. 36) I confess and I admit that I was WRONG… baby please forgive me because I know that our love is RIGHT. 37) Your sweet smile is the light at the end of all of my life’s dark tunnels. I love you. 38) I don’t know what you expect of me as your husband, but I expect myself to be nothing but the best… in that, I’ve faltered. I’m sorry. 39) I’m sorry, for feeling so protective… it’s just that I can’t bear to see anything take away that smile on your face. 40) I know, I’ve been a complete jerk. Take your time, take however long it takes… I’ll be right here, waiting with my arms wide open. I’m sorry.